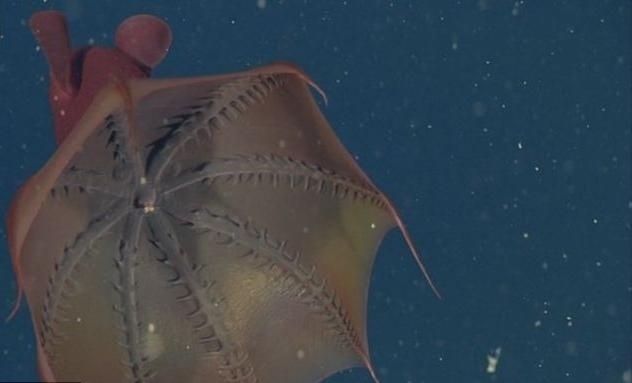 The Vampire Squid looks like something that swam out of a late-night science fiction movie but in spite of its monstrous name, its is a small creature growing to only about 6 inches in length. 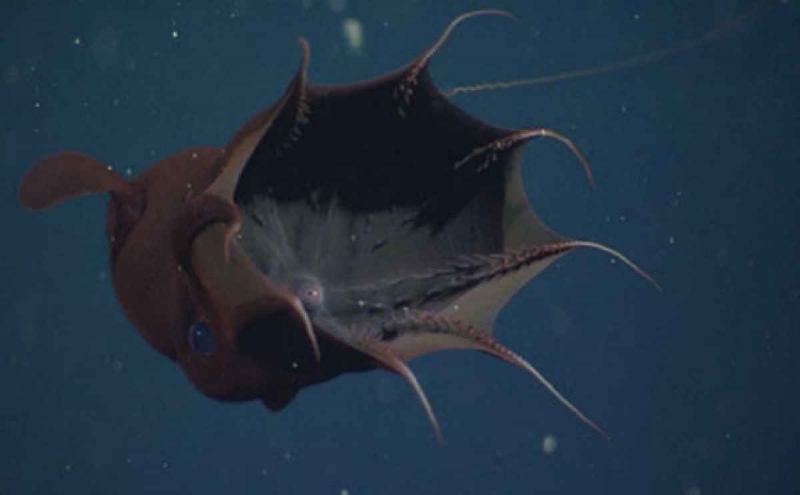 The Vampire Squid is an ancient species and a phylogenic relic, meaning that is the only surviving member of the order Vampyromorphida. 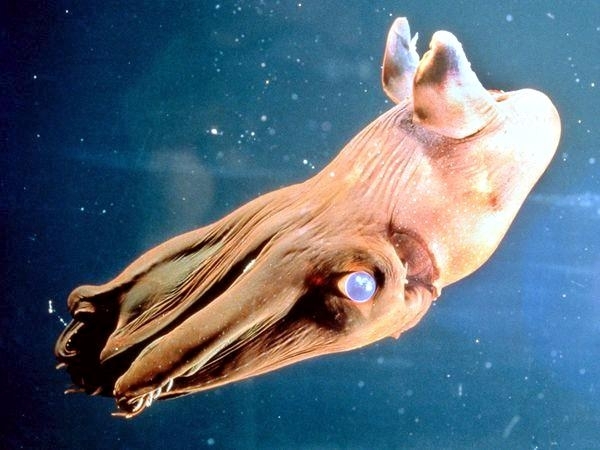 It is a unique member of the cephalopod family in that it shares similarities with both squid & octopus. 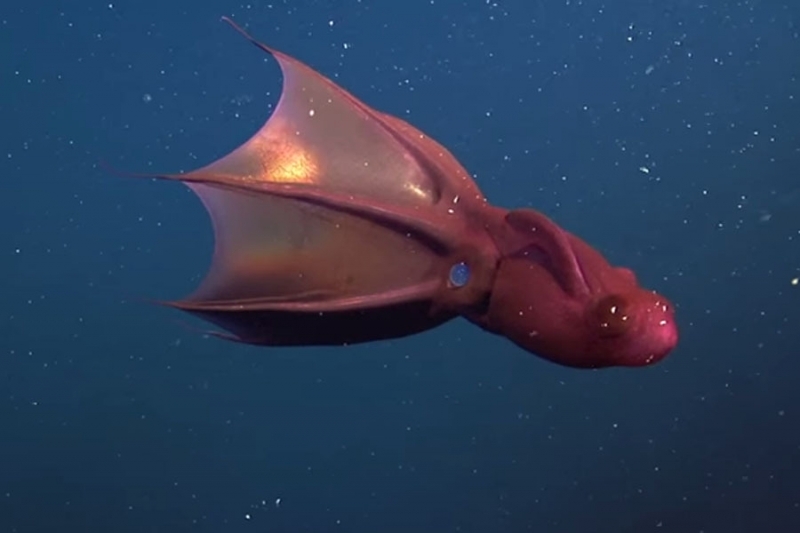 In fact, it was originally and mistakenly identified as an octopus by researchers in 1903. 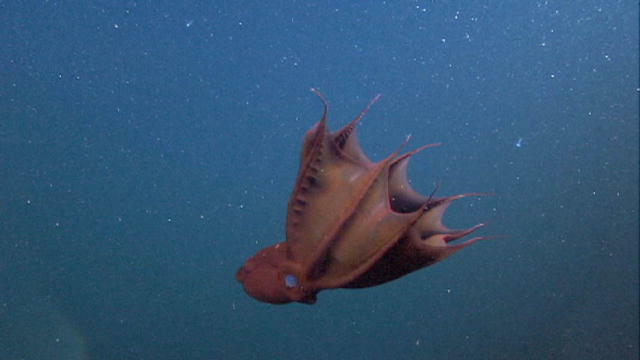 The Vampire Squid has large fins at the top of its body that resemble ears. These fins serve as its primary means of propulsion as it literally flies through the water by flapping these fins. As with other squid, it can also use jet propulsion to move by expelling water through a specialized siphon jet located just under its mantle. 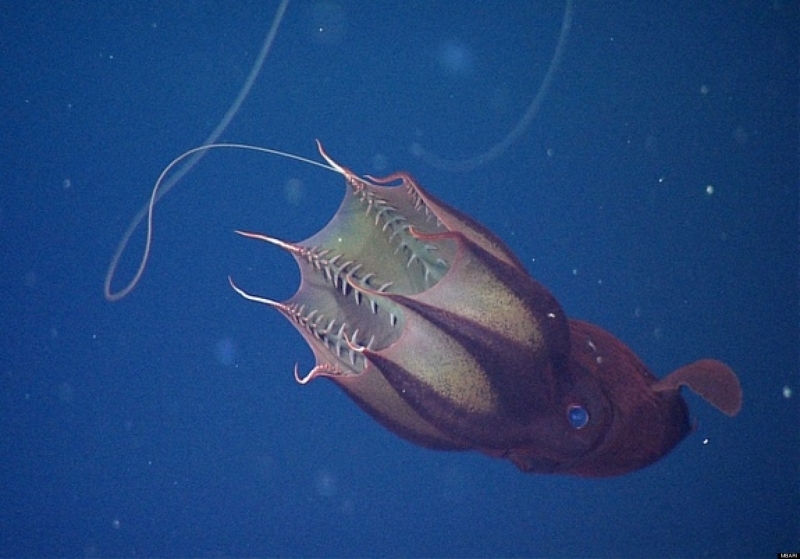 The Vampire Squid has a very gelatinous form, resembling a sea jelly more than the common squid. 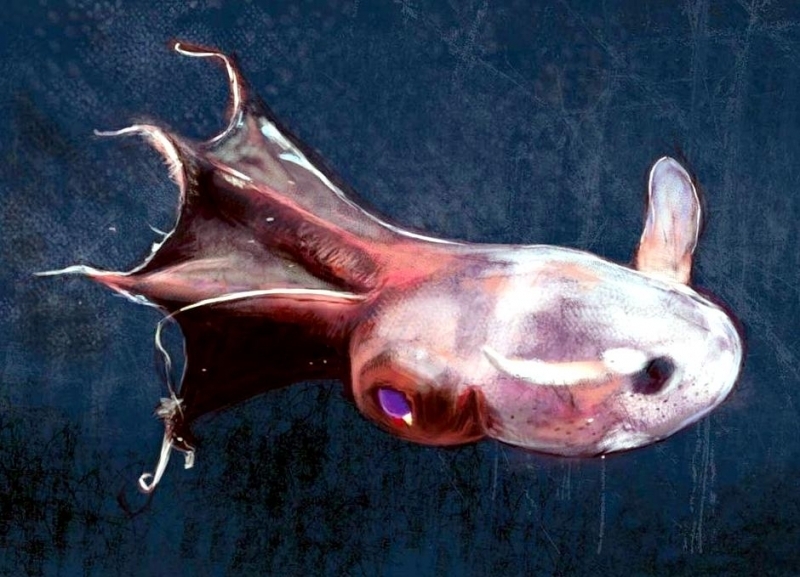 It can swim surprisingly fast for a gelatinous animal, reaching speeds of over 2 body lengths per second. It also has the largest eyes relative to its body size of any animal. Though it is relatively small, growing to a length of only about 6 inches, it has globular eyeballs about the size of those of a large dog. These large eyes can appear red or blue in color, depending on the light. 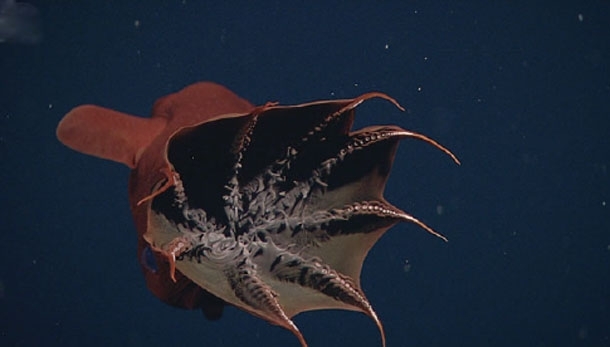 The Vampire Squid’s 8 arms are connected with a webbing of skin, which makes it look more like an octopus than a squid. 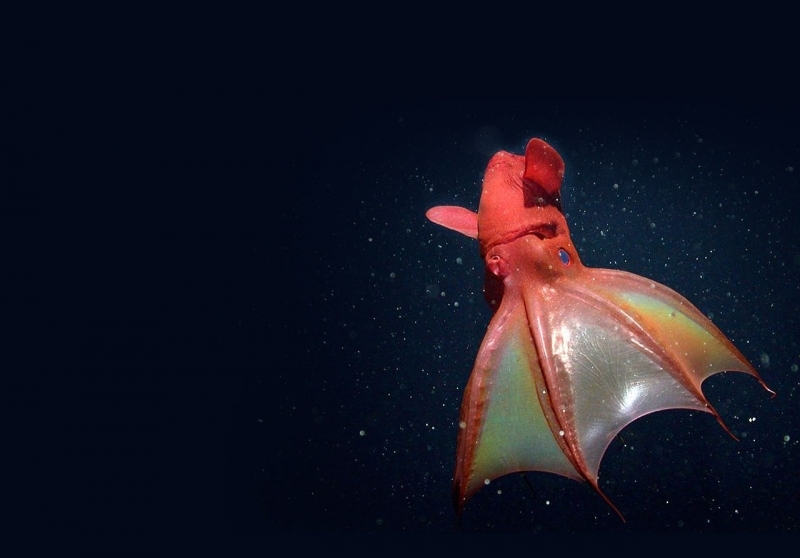 When threatened, the Vampire Squid can draw its arms up over itself and form a defensive web that covers its body. 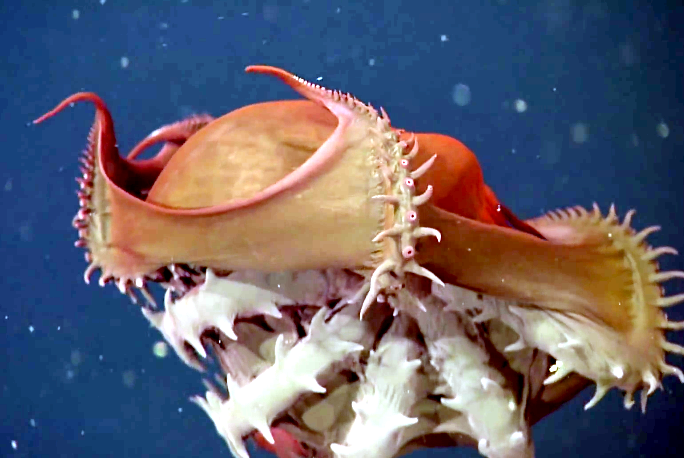 Each of the 8 arms is lined with a single row of suction cups and rows of soft, fleshy spines known as cirri. 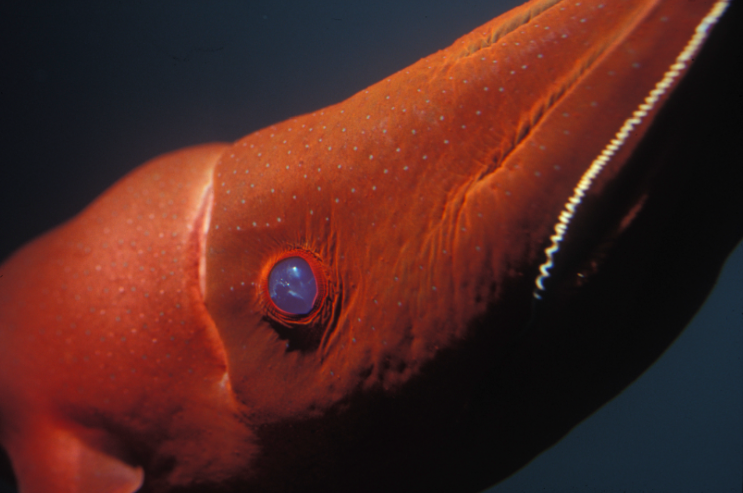 It is these spines, along with the cape-like webbing and red eyes that give the Vampire Squid its unusual name. 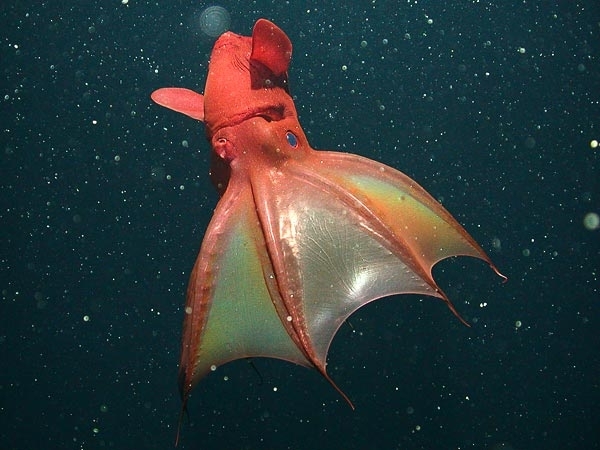 Located inside the Vampire Squid’s webbed arms can be found a pair of retractable sensory filamnets. These filaments are similar to the 2 long tentacles found on other squid species. 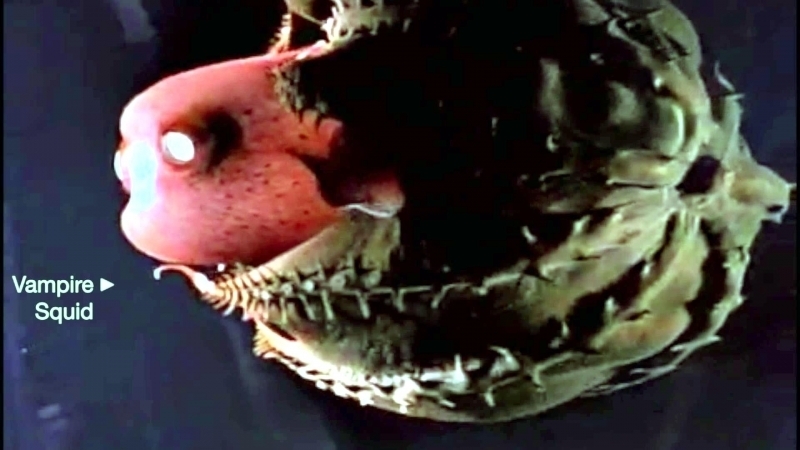 Also located within the webbing are 2 powerful beak-like jaws. These jaws are as white as ivory and are strong enough to crush the shells of crustaceans. 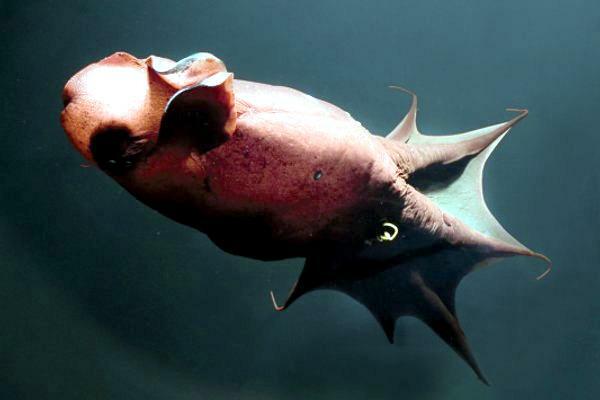 The Vampire Squid’s color ranges from jet black to pale red. 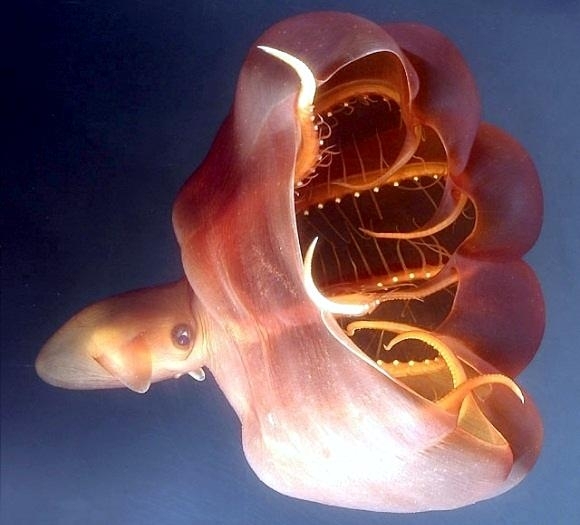 The Vampire Squid’s body is covered with light-producing organs called photophores. 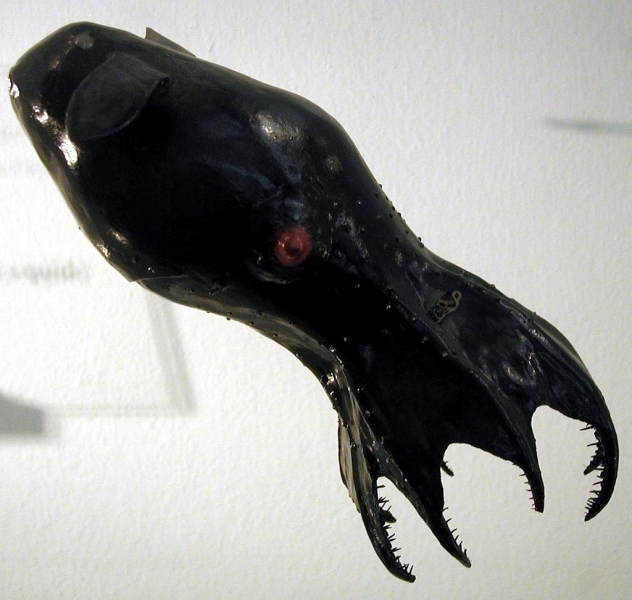 This gives the squid the unique ability to “turn itself on or off” at will through a chemical process known as bioluminescence. 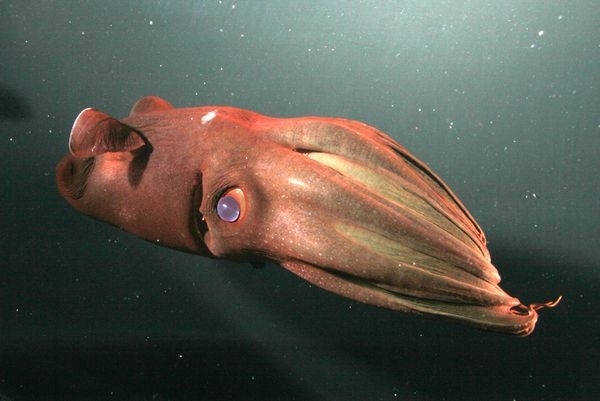 When the photophores are off, the squid is completely invisible in the dark waters where it lives. 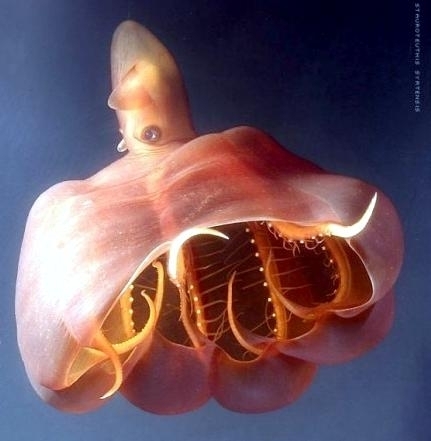 The Vampire Squid has incredible control over these light organs. It has the ability to modulate the size & intensity of the photophores to create complex patterns that can be used to disorient predators and attract prey. 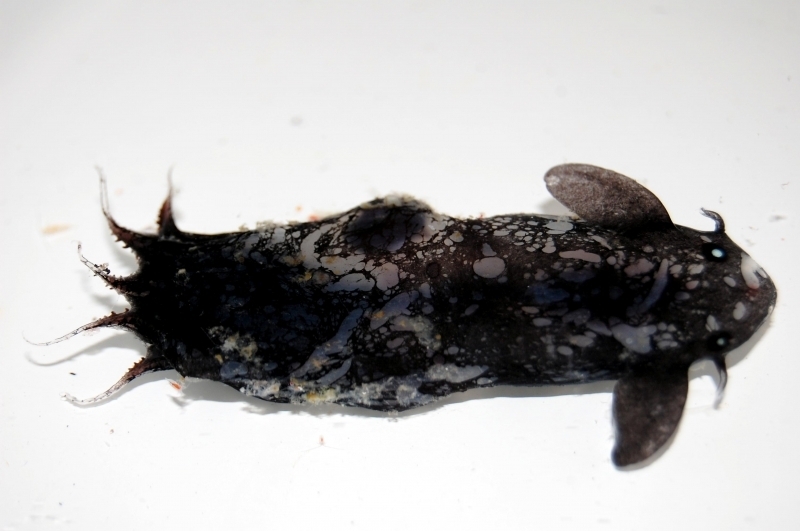 The photophores are larger and more complex at the tips of the arms and the base of its 2 fins. 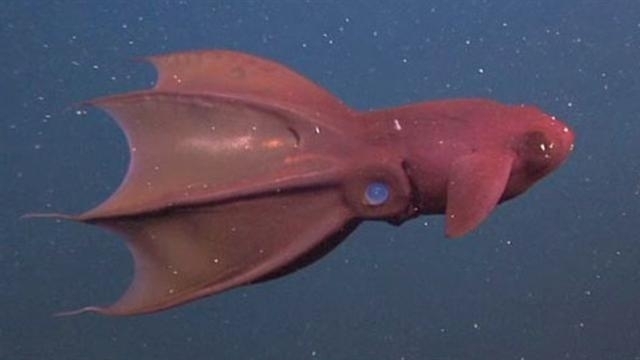 Unlike most other squid, it does not have the ability to change its color. This ability would be useless in the dark environments in which it lives. 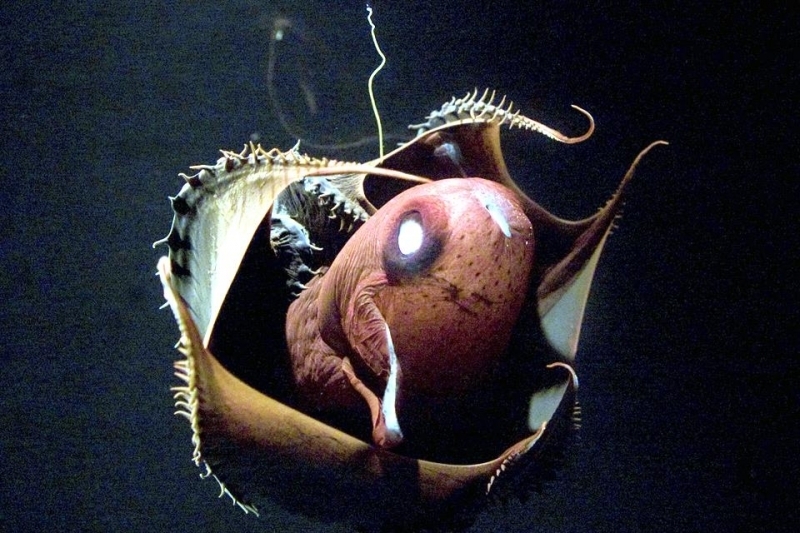 The Vampire Squid’s light show is probably its main form of defense, since it lacks the ink sack which is present in other squid species. It can however, eject a thick cloud of glowing, bio-luminescent mucus from the tips of its arms when threatened. 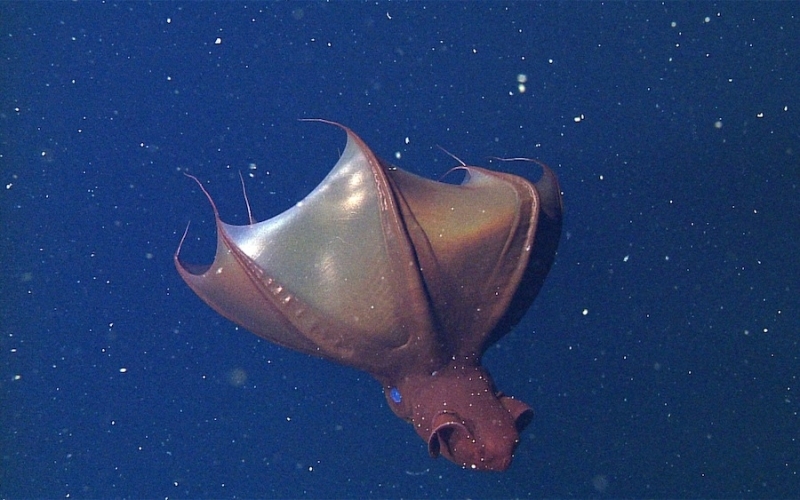 Not much is known about the feeding habits of the Vampire Squid. 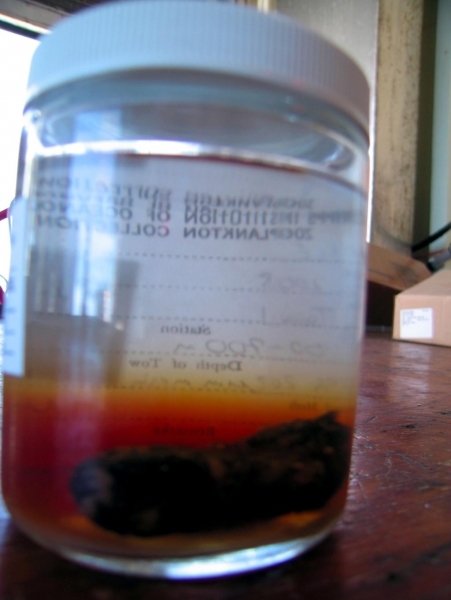 Its diet is believed to consist of prawns, copepods, cnidarians and other small invertebrates. 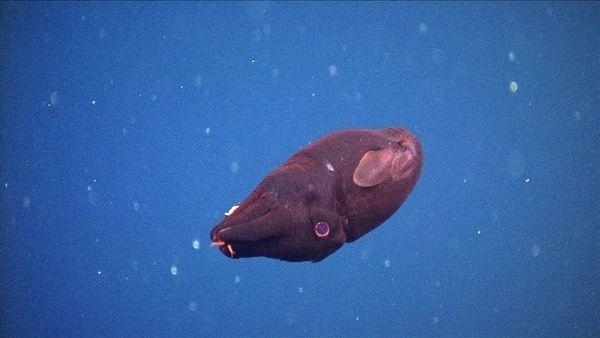 The beaks of Vampire Squid have been found in the stomachs of seals, whales and fishes indicating that it is a favorite prey item for many deep-diving species. 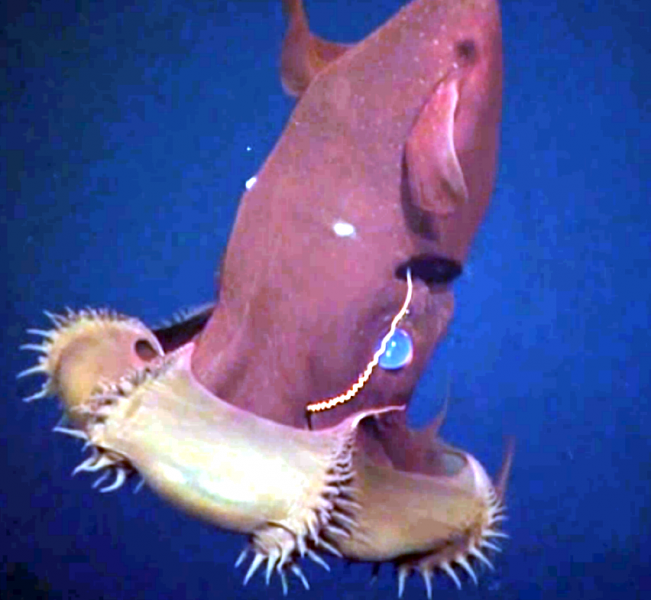 The Vampire Squid has an extremely low metabolic rate, indicating that it can go for long periods of time without feeding. 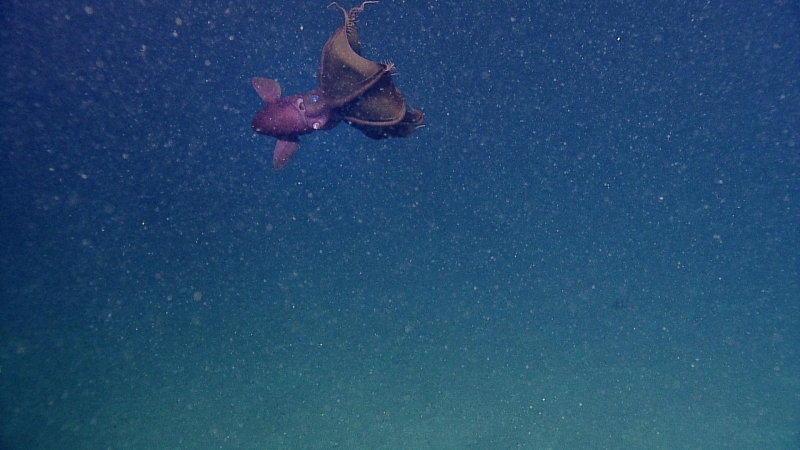 This is an important adaptation seen in many deep-sea species since food can be hard to find at these extreme depths. 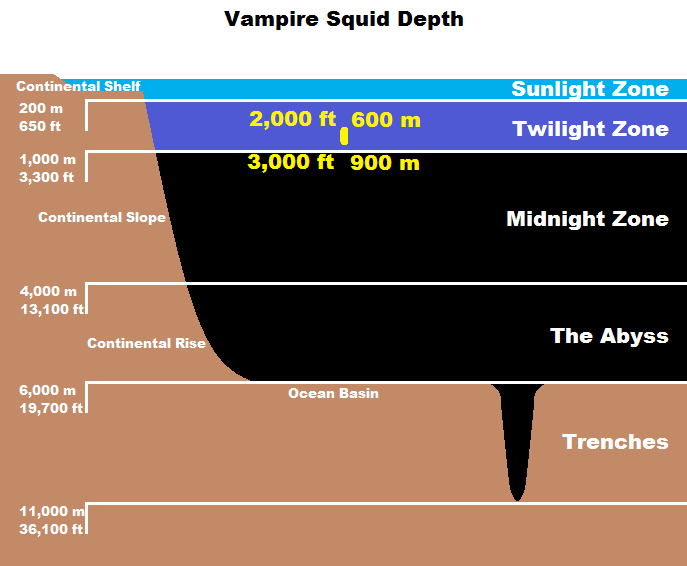 As with most deep water creatures, very little is known about the reproductive habits of the Vampire Squid. 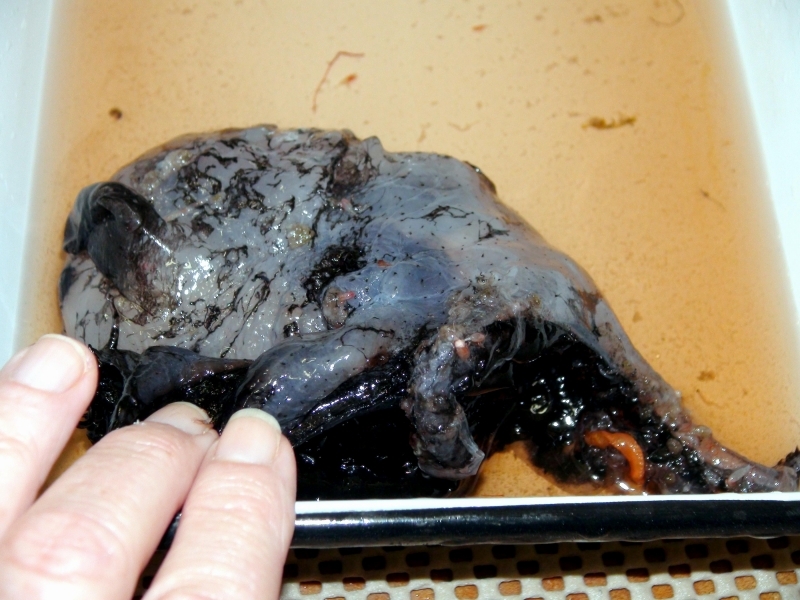 We do know that the eggs of the squid are small & opaque, reaching a size of about 8 millimeters. They are thought to reproduce slowly by laying a relatively small number of eggs. 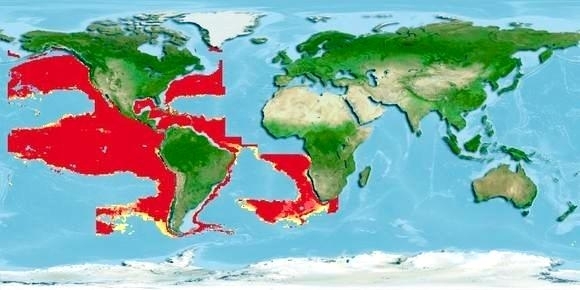 The distribution of eggs has been found to be similar throughout the year, indicating that there may be no particular breeding season. Once the eggs hatch, the young hatchlings will drift with the water. They resemble miniature versions of the adults except that they lack the webbing between the arms and their eyes are much smaller. 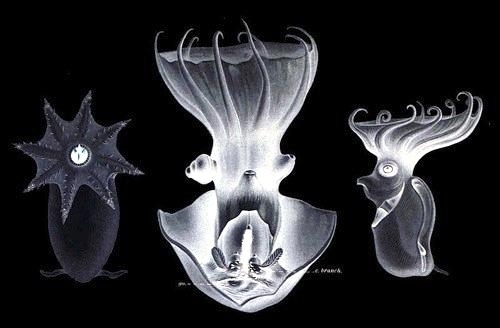 As they develop, the young Vampire Squid undergo what has been described as a double metamorphosis. 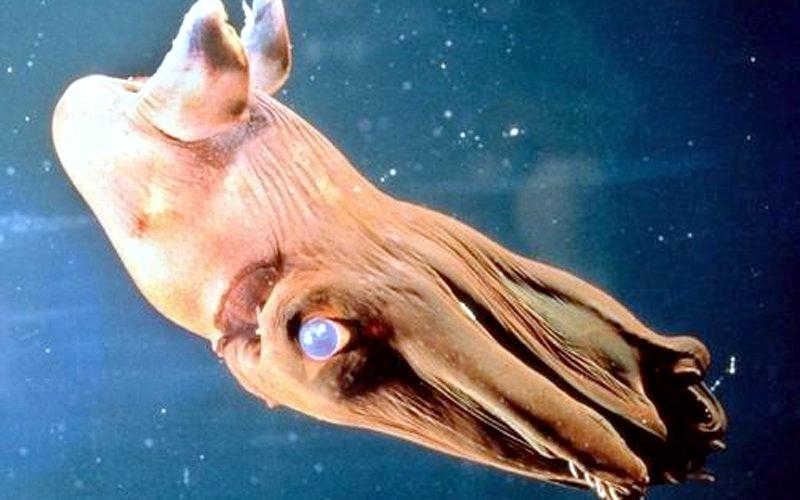 At early stages of development, the young squid have a single pair of fins located near the eyes. At a later stage, this pair of fins gradually disappears as a new pair develops. As the animal reached maturity, these fins are re-sized and re-positioned to maximize swimming efficiency. 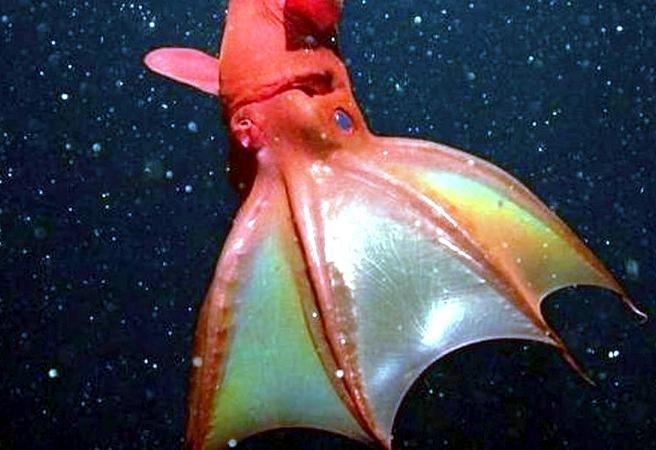 Vampire Squid are found throughout the deep oceans of the world in most tropical and temperate regions at depths of between 300 feet (about 90 meters) and 3,000 feet (over 900 meters). 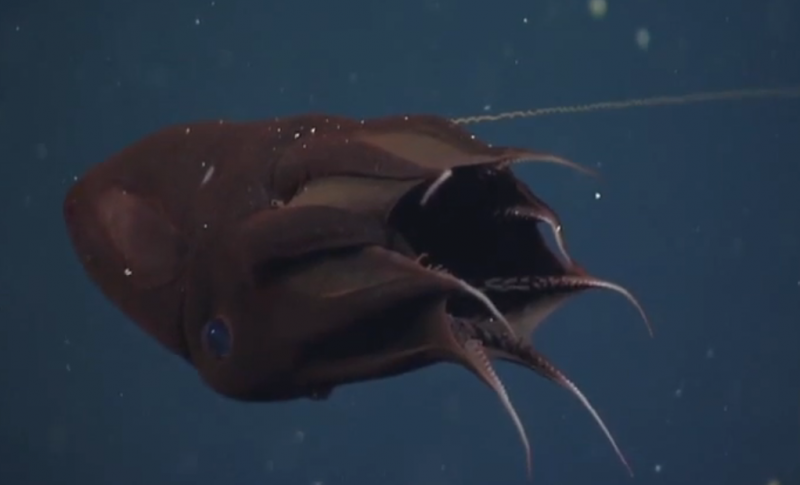 They live in the oxygen minimum layer of the ocean where virtually no light penetrates. They seem to prefer a temperature between 35 and 43 °F (between 2 and 6 °C).